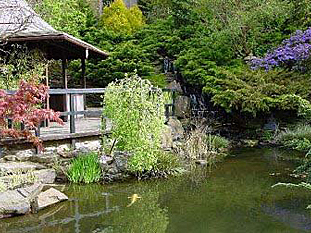 Authentic Japanese Garden set in 1.5 acres: Water garden with koi carp, stroll garden, woodland garden, Zen garden & bamboo grove. Japanese Maples, azaleas, rhododendrons & ornamental grasses in abundance, an oasis of tranquility. 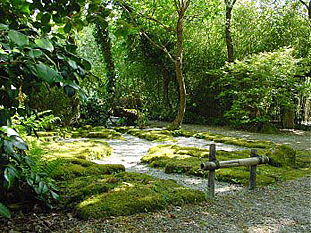 As the nursery became established we turned our attention towards the creation of the Japanese Garden. In 1991 test ponds were dug confirming, as suspected, a solid layer of clay below a topsoil one metre deep over the washed gravel of the water table. Soon after we acquired 20 tons of weathered, moss-covered granite boulders and with this the development of the garden took a quantum leap. Rocks, plants and water are the unifying elements in Nature and are therefore of paramount importance. Rock reflects strength, stability and endurance. The placement of these and other stones in the garden enhances the feeling of safety and security one needs in order to relax. Under Robert’s direction a digger was employed to shape the site and position these important rocks. One of these huge stones lies at the base of the waterfall, others were placed close to the edges of the pond or were used in the formation of the maple-topped mountain, whilst a select few were chosen for the Zen garden. 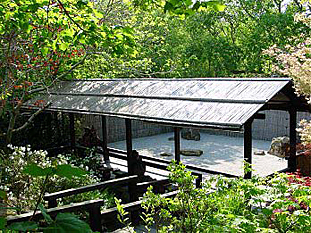 Over the following seven years we concentrated our efforts on the garden remaining true to the initial design that first took shape in our minds and was later transfered to paper – deviating only in the siting of the Karesansui [Zen garden]. Originally we had thought to place it close by the Cha-Seki [Teahouse] but later decided it must occupy a more secluded, quiet spot. A30 >A39 > A3059 following signs to Airport & St. Mawgan. Japanese Garden Brown & White Road Signs on A3059 and B3276. St. Mawgan village is directly below the Airport.